We are here to assist, let’s trade up! Trade-Up is an independent consultancy that advices companies, organizations and governments how to take advantage of global trade opportunities, improve trade conditions between countries and regions and overcome specific barriers to trade. Trade-Up supports the further strengthening of bilateral, regional and multinational trade agreements including regulatory cooperation around the world. In our Think pieces we reflect how to best help promoting this. Trade-Up offers strategic advice to companies pursuing international trade opportunities and taking a global perspective when it comes to the regulatory and political environment to operate in and engage with. 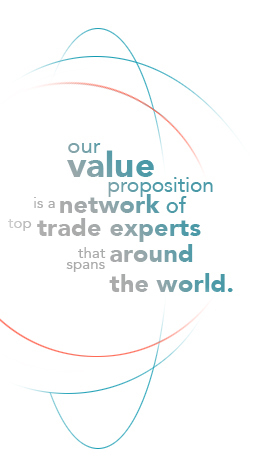 At the core of our value proposition is a network of top trade experts that spans around the world. Many of our Experts are former government officials that have been key figures in resolving trade issues and negotiating successfully important trade agreements. Our network offers a unique mix of high level contacts, hands-on negotiation experience and in-depth sectorial knowledge – this allows us to deliver concrete solutions !